"I may be a fool, but I'm a fool that always wins." 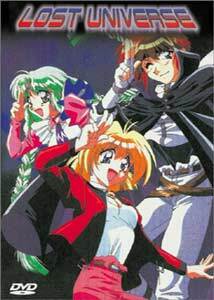 With the incredible popularity of the Slayers series, it is no surprise to see the creative team and voice talent reunited for another show, and Lost Universe has been called "Slayers in space" on a number of occasions. Manga author Hajime Kanzaka is again at the writing helm, teamed up with Shouko Yoshinaka who also handles the character designs. The voice cast brings together Slayers alumni Megumi Hayashibara (who also sings the closing song), Hikaru Midorikawa, Masami Suzuki, and Kyoko Tsuruno (Martina in Slayers Next). Kain Blueriver (Souichirou Hoshi) is a "trouble contractor," a more respectable name for bounty hunter, travelling around the galaxy on missions for those who pay. He is a formidable adversary, wielding a psychicly charged sword known as a Psi-Blade, and his penchant for style requires the adornment of his trademark cape—an item which invariably sparks the ridicule of all he comes across. He undertakes his tasks in his Lost Ship, the Swordbreaker, which possesses rare and forgotten ancient technologies, including a physics-defying hyperdrive, and the ability to manifest itself in the form of Canal Vanfoil (Megumi Hayashibara), Kain's trusty holographic sidekick. Canal is fastidious about her ship's appearance, and gets extremely upset should any form of debris or dirt find its way onboard. Millenium "Millie" Feria Nocturne (Kyoko Tsuruno, formerly known as Fuyumi Hiiragi) is determined to become the universe's greatest something, so she can become famous through her autobiography. When Kain and Canal interrupt her as she is attempting to become the galaxy's best detective by exposing a crime syndicate responsible for auctioning various stolen goods, Millie decides to become part of the Swordbreaker crew, as retribution for losing her job. Aboard the ship, Millie is now working on becoming the universe's greatest cook, however her culinary attempts require blowing up the kitchen with every meal, an event that Canal is none too happy with, though Kain likes the edible results. With this trio on the loose, their quarry had better beware!Aside from their exploits with a leading crime family, disc one also introduces us to a couple of the team's associates: Rail, a member of the intergalactic police force, the Universal Guardians, who dumps his unwanted jobs on Kain, and Rail's assistant, the clumsy Nina, who has interface problems with electronic gizmos. While mostly an introduction to the cast, we're off on a string of adventures of an episodic nature, with hints at some underlying story arc being thrown in each installment. This is certainly not a series to be taken as serious—the humor is continuous, and unlike shows who rely on one character to be the idiot, we have an entire collection of goofballs to deal with here. Everyone has at least one bizarre quirk that can set up the fun factor, and the rivalry between the crew and their ability to get on each other's nerves is half the entertainment. The exposition is strong, and it was easy to settle in to everyone's attitudes. The show also incorporates some CG elements for the space scenes, which don't entirely mesh with the look of the rest of the production. Aside from some anomalies from the motion rendering, I'm not all that put off by its inclusion; while obvious, it isn't as glaring as some of the CG work I've seen in anime. Lost Universe is shaping up to be another laugh-filled ride, and I'm having a great time so far. Image Transfer Review: Video quality is better than expected for a catalogue title. Colors a vibrant, blacks are solid except for a couple of title cards, which are also the few places where any form of digital artifacting exists. There is some grain in places, but except in very dark scenes, this isn't a real problem. Typical amounts of aliasing and a few areas with some interlacing are present. The CG sections do stand out from the rest of the animation, but not as bad as they cold have, and movement here is somewhat stuttery due to the source.I would mention that the persistence of the subtitles seems somewhat eratic, rather than looking solid on screen. Audio Transfer Review: The stereo soundstage is well utilized, with dialogue sticking to center most of the time, but music spreading well into the left and right channels. There was a bit of edginess on some of the voices, but nothing really bad. Frequency range doesn't dive deep into the bottom end, but still comes off natural and pleasing. 6 Other Trailer(s) featuring Ruin Explorers,Slayers: The Movie, Neon Genesis Evangelion, Burn Up W, Bubblegum Crisis: Tokyo 2040, ADV mix trailer. Extras Review: Ah the good old days, when ADV front-loaded their trailers. Here we have Ruin Explorers,Slayers: The Movie, Neon Genesis Evangelion, Burn Up W, Bubblegum Crisis: Tokyo 2040, and the ADV mix trailer. The main menu allows access to the trailer reel, though not individual titles. I would mention that the main menu has the whole opening theme playing behind it, which I highly enjoy, and the Japanese production credits form the final chapter of the disc, with the English credits ending each episode. That's about it for extras on this disc! The first four episodes of Lost Universe set up what looks to be another wacky, fun-filled series. The personalities are strong, the voice acting great, and the situations highly comical. Strap yourself in, it's time for an intergalactic comedy of universal proportions!